Spinz has been passed around the world on stages and by the crowds, over 1,000 times now in 35 different countries to be exact. This west coast rap pioneer's relentless hard work in the studio and on stage has earned him a place in hip hop history forever. Spinz also known as $cotty Westwood has toured and worked with the likes of Royce Da 5' 9'', Ca$his, Swollen Members,Smoke DZA, Big Shug, Outlawz, Georgia Anne Muldrow, Kurupt, Demrick, Rikanatti, Koolade and many of rap music's elite. Wearing many different hats as an MC, writer, producer, audio engineer and independent A&R. With 3 succesful solo albums to his credit, countless mixtapes, singles and features, he has remained a permanent fixture in the west coast hip hop scene for almost a decade now. Receiving numerous accolades during his carreer from being named to Urb Magazine's »Next 1000« alongside the late Amy Winehouse, Souljah Boy, and Bishop Lamont to an MTV 2008 EMA nomination for »Best Live Act« with his live band DankXperienz. Spinz has been interviewed by various publications such as MTV, L.A. Times, XXL Magazine, Source Magazine, Urb Magazine as well as countless foreign publications. He has also appeared on the silver screen acting in various movies such as Jackass, The Job, In Your Eyes, and Shanghai Gypsy. 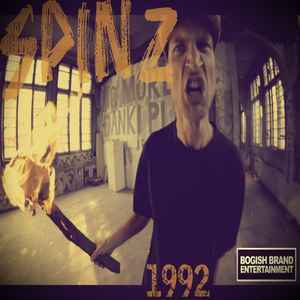 Spinz recent release of »1992« was produced by Shady Records producer Rikanatti who has produced for the likes of Eminem, Obie Trice, Busta Rhymes, Crooked I, and many more. Additional production by Filiblunt, Elespecialista (Spain), DJ LKB (Switzerland), Dinobeatz (Croatia) and Bay Beatz (Bosnia & Hercegovina). The tracklisting of 14 consists of major artists such as Ca$his (Shady Records), Big Shug (Gangstarr), Famous Fame, Rone Jeremy and reached the iTunes best sellers list in many countries as well as various songs being placed in television commercials and movies worldwide. Spinz resides in Ventura, California and was born in Oxnard, California where he keeps close ties and stays active with his original crews FND Entertainment and High Life Kingz whom he has been affiliated with for more than 20 years now. Spinz is represented by FND Entertainment and additionally through his own independent record label Vibra Music Group which he started as a platform for releasing up and coming artists and also serves as a foundation for youth music workshops teaching hip hop culture, music production, writing, and business. Vibra Music Group is an eco-friendly record label started in 2007 and now promotes over 20 artists from various countries around the world in genres such as Jazz, Electronic, Rock, Rap, and Ethnic music.